Kathmandu Post review of "House of Snow"
The book crisscrosses genres, straddles ages and dissolves the boundaries of nations and cultures to bring together those who are bonded by the common desire to talk about their Nepali experiences. Alongside the works by the gems of Nepali literature (Bhupi Sherchan, Bishweshwar Prasad Koirala, Lakshmiprasad Devkota, and Lil Bahadur Chettri) and popular Nepali authors writing in English (Manjushree Thapa, Sushma Joshi, Samrat Upadhyay) are the accounts of foreigners writing about the country. There is Michel Peissel with his story of Boris Lissanevitch, the Russian émigré who opened the first hotel in Nepal; an excerpt of Jon Krakauer’s bestselling personal account about the 1996 Mount Everest disaster; and Michael Palin with his trekking diaries. 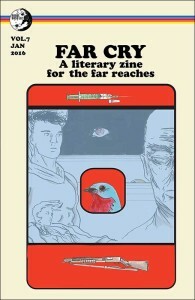 And if you are into science fiction, do order a copy of the Far Cry Zine, which just published my short story "Orange Peel."